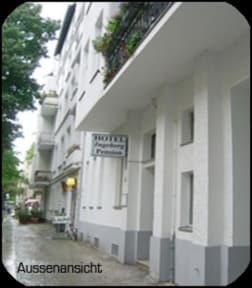 Hotel Pension Ingeborg is located in the very central area of the western part of Berlin, close to the Kurfuerstendamm. The world famous shopping mall of Berlin is within walking distance of the hotel. Kurfuerstendamm or just short Kudamm offers everything you could possibly want - hundreds of different boutiques, stores, and various cafes and restaurants. It is a perfect place to spend time with your friends and enjoy life to the fullest since all the best bars and clubs are open from dusk till dawn. Our hotel is especially excellent for groups and school trips. There are 30 beds in 10 triple, double and single rooms. Some of the rooms are equipped differently: rooms with shower and toilet, rooms with shower and toilet in the corridor . Our big and comfortable breakfast hall can also be used as a nice entertainment room. All guests receive complimentary breakfast.